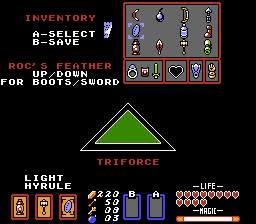 how do you get the Master Sword? Last view: 985 days You mean this sword? 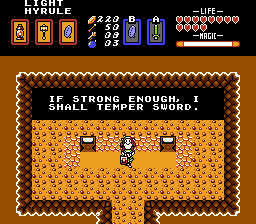 That's the tempered sword. And it won't let me have that one either. I'm trying to grab this one, but no matter what I press, nothing happens. I've seen a couple of video walkthroughs, and they just grab it after beating three or four dungeons. And they don't have any equipment that I don't have. But I wasn't able to do that. Maybe it's a bug in the latest release? Last view: 12 days The minimum to pull the master sword is to have 6 heart containers. I'll take a look tonight to see of there's an issue. There shouldn't be since I never touched that code. Just to see if I could duplicate the bug, I started a new save file, and as soon as I beat the first three dungeons, I went for the master sword. This time, I could grab it, no problem. Maybe it just didn't like me the first time. Or maybe if you have too much equipment, it spazzes out or something. Last view: 988 days New to the board but have been following your projects (and putting them on carts) on romhacking. Tonight I have updated one of my carts to this new update with the star and the save. I am not able to access the save files for file 2 and file 3 on my cart. My cart is made from Romance of the three Kingdoms 2 (famicom). I am using a Gyromite 60-to-72 joint to play on my front loader official NES. I had my M27C801 chips in sockets so I could easily change as new MMC5 games were created by you to test/play. My problem is that when I press LEFT or RIGHT to access the files other than FILE 1 the game will freeze and also I will get a steady audible tone. It stays like this until I reset. When I try the patched rom in FCEUX 2.2.2 there is not a problem accesing the other files though. What could be the problem? The previous version worked great. Last view: 977 days The issue is not directly connected with SRAM size. I tried the new patch on few mmc5 boards (famicom) with single 32kb SRAM chip and the issue is present on all of them. Maybe it needs some kind of erasing option for all sram data at the begining? Last view: 727 days Yup, must be cause it has a old save on it. That's why infedelity tells you to erase your save when you use the patch. Last view: 988 days Old saves or erasing the save is not the problem and does not solve the issue by erasing them. it must be the SRAM. What famicom donors would work then? I know it cannot be the save because my battery is in a holder; I can pop it out and wipe the save file easily. I can even leave the battery out so that it cannot save and I still cannot access file 2 or 3- it freezes without the battery present (no old save file present at all). Romance of the three kingdoms 2 (Sangokushi II) is EWROM and is capable of 32kB ram. This is my donor cart for this new patch. Last view: 10 days Pulling the battery does not solve the issue with crashing when selecting the second save slot. If you load a save from an emu it will. This is what worked for me. Last view: 12 days I wish I had the magical answer for this. It is confirmed that this works on an mmc5 cart, I had one shipped to me. I believe the board is an EWROM mmc5 board. I apologize for people having such a difficult time getting this to boot on real hardware, but it is possible. More in depth with my sram setup. You want to start the game for the first time completely fresh, no sram at all. $5113 by default is page 00. When the registration screen pops on, the default file is always file 1, because that occupies page 00 of $5113. When you go to either file 2 or file 3, what a happens is the following. I swap out page 00 from $5113, and have it insert either page 01 or page 02, I then check a specific register to see if this page has been properly constructed (because more than 3 quarters of S6000-$7FFF is occupied with PRG-RAM), if there is data on this page, I do nothing, if there is no data on here, what I do then is load page 00 back, and I load each individual byte from $6000-$7FFF, one at a time that is, I'll store it to ram, swap back to the either page 01 or page 02, store the byte, then I reload page 00, and I do this process until the PRG-RAM is copied. Because if the PRG-RAM is not present in either page 01 or page 02, the game will crash. I have tested this extensively on FCEUX, and the most accurate and pickiest emulators Nintendulator & Nestopia. All 3 major PC emulators deliver the correct results I set out to accomplish. I personally have zero idea how carts are made and designed and setup, that's out of my league. All I can tell you, is that my code is correct, my design in the way I want it to function is correct. It has to be a hardware issue, and it seems absolutely related to sram, because again, The Legend of Zelda heavily uses $6000-$7FFF for PRG-RAM. If the MMC5 $5113 is swapping, and nothing has been written to the new page by the time it is swapped into $6000-$7FFF, then the game will crash. Also I just want to say how appreciative I am, to how badly people want this to work on real hardware. It means alot to see the lengths you all go to. I've seen many youtube videos from various people, and I'm honored and humbled at all the dedication and work it takes to pull it off. Last view: 17 days hi infidelity. 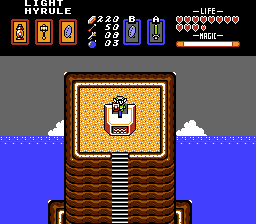 It's great that you posted a new version of the Legend of Link game that has a 3-game file save system - I had been wondering for a few years why only 1 file save was available in previous versions and not 3 like in the original Zelda1 game. If there was a way to make the game work on the higan multi-emulator that would be nice too. There was a discussion about it almost a year ago in these forums. Why would you use higan for NES emulation, just to ask? Pretty sure it's in a premature state compared to other, more developed NES emulators. Also, puNES is the most accurate NES emulator available, I believe. From my re-release notes on the 1st page. I destroyed the original $6000-$7FFF sram when designing my game, because I tried using more space for things, the sound engine ram registers are located within there. 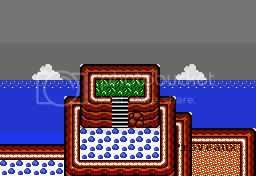 The original Zelda HEAVILY uses the sram for PRG, because 3 quarters of the HW bank are occupied with DPCM data. When I converted my rom to MMC5, I wasn't that fully experienced with register $5113, which allows you to swap out 4 pages (2000 bytes each) of sram. It wasn't until my Super Mario All-Stars NES project, that I fully understood how to take advantage of that. So just a few days ago, I went back to see if I could pull it off within Legend of Link. I'll spare getting into details, but I was able to make it so just before the registration screen kicks on, I simply copy a byte at a time from the 1st sram page, then i'll swap the page, and paste that byte into the new sram page, and I do that for the rest of the pages. And I added a safety check, so that my routine doesn't overwrite saved data once it's created. Then it was just a cosmetic issue for me to come up with, in order to use the File system on the registration screen. So glad I got that working! It always upset me when players would defeat the game, and were faced with having to delete all that they did to start over fresh. I'm sorry it took almost two years, but this has finally been resolved." Last view: 931 days Hey Infidelity, just curious on what you have planned for next? Anything you can share? Last view: 779 days This game is amazing and I'm really enjoying it. Is there a walkthrough or something though? I found the entrance to the 3rd level, but can't figure out how to get in...I feel like I must be missing something simple. This game is amazing and I'm really enjoying it. Is there a walkthrough or something though? I found the entrance to the 3rd level, but can't figure out how to get in...I feel like I must be missing something simple. Last view: 779 days I saw those - Excellent maps! Doesn't really help for level 3 though. Anyone want to drop me a hint on how to get in? The front door looks like it just requires a key (like with level 1), but it won't open no matter how many keys I have. If I remember correctly it should just unlock from the front. Go back down steps. Go left. Go up. Go left across water and lift rock to get to door. MySQL - queries: 126, rows: 167/0, time: 0.161 seconds.